In February, RWAV facilitated regional workshops across the state with Outreach Service providers, Aboriginal Community Controlled Health Organisations (ACCHOs), local Primary Health Networks and other local service providers to discuss all things outreach. The purpose of delivering the regional workshops is to focus on bringing together key stakeholders to discuss how the current outreach services are progressing, and identify the current challenges in their region. It is also an opportunity to work collaboratively together to improve outreach services and share resources regionally. Recently held were the Mental Health Service Collaboration Meeting and the Murray Regional Outreach Meeting. In one regional meeting, RWAV brought together key mental health stakeholders from across the Wimmera to discuss access to primary mental health services – psychiatry services in particular. Representatives from the region came together to discuss the issues facing the community of Horsham and surrounding townships. Stakeholders included a RWAV Outreach psychiatrist as well as representatives from Ballarat Health Mental Health Services, Budja Aboriginal Co-operative – Halls Gap, Mental Health from the WestVic PHN, Uniting Care, Partners in Recovery, Grampians Region, West Wimmera Health Service, Headspace Horsham, Rural North West Health and Royal Flying Doctors. Key issues raised included the recruitment and retention of a mental health workforce, in particular psychologists and psychiatrists to the region, which is a significant gap in the workforce. The main outcome of the meeting was to establish a telehealth psychiatry service that will support the current outreach psychiatry service to Horsham, and the sourcing of a psychologist. RWAV will work with key stakeholders from within the region to support this model. RWAV facilitated the second regional Outreach meeting with the Murray Aboriginal Community Controlled Health Organisations (ACCHO) including Rumbalara Aboriginal Co-operative Ltd. and Njernda Aboriginal Corporation. The meeting commenced with each ACCHO providing a brief overview of how their current outreach services are tracking. 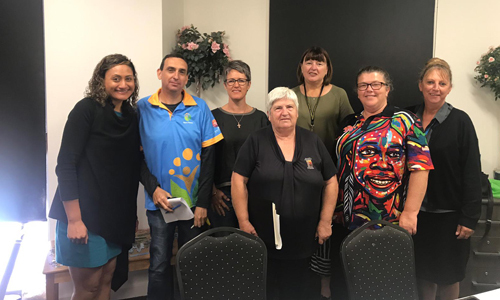 From left to right: Merina Ashdown (RWAV), Jackie Giles (Njernda Aboriginal Corporation), Johanna Nesbitt (Outreach Audiologist), Anne Munzel (Njernda Aboriginal Corporation), Karen Moodie (Rumbalara Aboriginal Co-operative), Brenda Grist (Rumablara Aboriginal Co-operative), and Cindy Mcgee (Rumbalara Aboriginal Co-operative). In this meeting, RWAV facilitated a brainstorming workshop where the ACCHOs were given an opportunity to explore new mental health and telehealth initiatives within their regions. The take home message for the ACCHOs was to look at more sustainable funding models where they could look at other long-term sources of funding such as local funding. Overall the regional meeting gave an opportunity for the ACCHOs to look at their current outreach services and start looking beyond RWAV funding, enabling the ACCHOs to be more self-sufficient with their service delivery.